Over at MentalFloss, there's an article on why Mr. Rogers was the best neighbor ever. That story got picked up by Digg users, and at the time of this writing, it has over 2050 diggs. When Mr. Rogers died, the story appeared on Fark, followed by hundreds of comments mourning his death, and raising the point that if most Christians were like Mr. Rogers, they'd gladly support anything Christianity did. The Digg comments have followed suit. The thing I liked best about Mr. Rogers style of teaching morals or principles to children was he didn't just preach or call things "bad". He showed what doing certain things did to relationships and situations, and had the characters reason out solutions and analyze their impact on the situation. Personal responsibility was also emphasized over totalitarian rule sets. It was very positive and its unfortunate that our society seems to be moving away from teaching kids to think in this way. 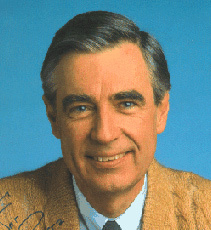 "Despite being an ordained Presbyterian minister, and a man of tremendous faith, Mister Rogers preached tolerance first. Whenever he was asked to castigate non-Christians or gays for their differing beliefs, he would instead face them and say, with sincerity, “God loves you just the way you are.” Often this provoked ire from fundamentalists." Why can't all Christians be like that? Mr. Rogers was on of the greatest human beings ever to live. If the whole world was like him imagine the kind of world we'd live in. His personality traits are foils for our own flaws. Not to say the man was perfect, but it's hard to ignore that all of the flaws we are so intent on finding in others are so wholly revealed in ourselves when we stand next him. With effort and consideration, everyone can come to realize that much of what we fight over doesn't really matter. That we should be building relationships instead of walls, and that a little kindness goes a long way. Mr. Rogers was one of the most decent human beings to ever walk the Earth. His temperment, his love of people, his overall decency is something we should all strive toward. He was the modern-day embodiment of what is meant by Christ-like. And in the list of comments, I found this gem - "Thoughts for All ages." If the nonbelieving world could so easily identify Mr. Rogers with real Christianity, perhaps believers should pay more attention to what Mr. Rogers preached.